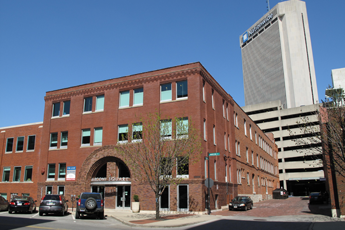 sparkspace is located in Downtown Columbus, OH in the Arena District on the corner of Marconi Boulevard and West Nationwide Boulevard. The main entrance is at 300 Marconi Blvd. Once inside, follow the red neon light to the elevator and proceed to the 2nd floor. See more detailed directions below. directions for guests with disabilities: Enter the building at 111 W. Nationwide Blvd under the white archway that says “The Design Center.” Once inside, follow the red neon light to the elevator and proceed to the 2nd floor. If you need assistance, please contact us at (614) 224-7727. The Marconi Cinema Garage -245 Marconi Blvd, Columbus, OH 43215 — located 1 block south of Nationwide Blvd on Marconi Blvd. NOTE: Marconi Blvd has 2 sections, separated by a railroad that you cannot drive across. The Marconi Cinema Garage is only accessible if you enter Marconi from Nationwide Blvd. There is also a garage called the Marconi Garage on the other side of the tracks. Confusing we know, but that’s why we mention it here. BOTH garages are sometimes called the Marconi Garage. You want the Marconi Cinema Garage at 245 Marconi Blvd. Metered parking on Marconi Boulevard. The meters now take credit cards. As a convenience for groups meeting at sparkspace, sparkspace offers validation service for the Marconi Cinema Garage. We will simply invoice you after your event for the number of tickets validated. NOTE: You do NOT have to bring your parking ticket to sparkspace for validation. We will give you a validation ticket when you leave sparkspace that you turn in WITH your original ticket. Please note: sparkspace typically does not validate individual parking tickets for “public” events like workshops and networking events unless otherwise noted during registration process. Please check your registration information or contact guesthappiness(at)sparkspace(dot)com if you have questions about parking validation. 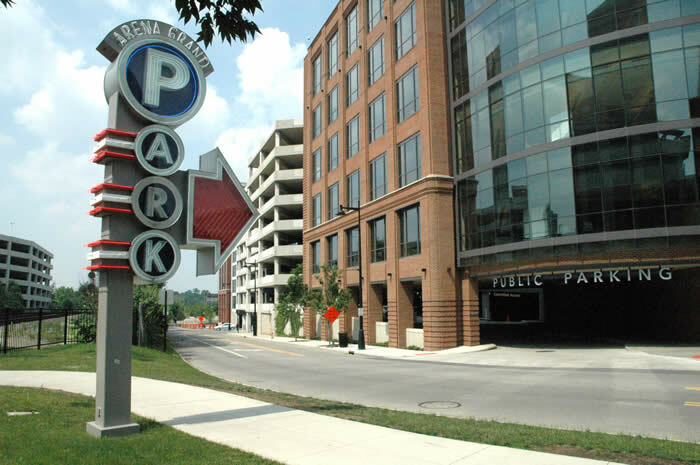 All major parking lots and garages in the area accept cash or major credit cards. 1 Look for this parking sign at 245 Marconi Blvd. Parking entrance for the Marconi Cinema Garage will be on your right. You actually enter through the building on the corner as the road curves. 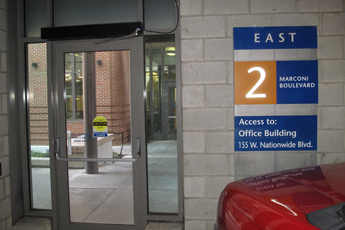 2 After you've parked in the garage, proceed to the exit located at East 2, to Marconi Blvd. 3 Turn left as you exit the garage on foot. 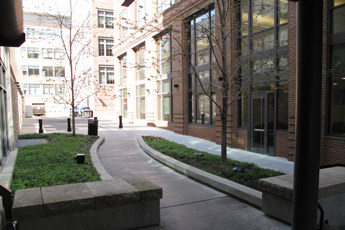 Take this walkway around the building. 4 This is the main entrance to our building. It's across the street from BD's Mongolian BBQ. Have questions about sparkspace? Check our our FAQs, and find answers!